Before taking any bold strides towards completely overhauling your office environmental policy it is advisable to first undertake a walk around the premises to identify any quick-fix bad environmental habits. One the biggest black spots in environmentally unfriendly office practice is wasteful energy use. 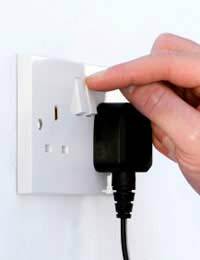 This could be in leaving on lights unnecessarily or leaving computers on standby rather than switching them off. Recent research has shown, for instance, that office equipment left on standby over ten days waste 43.6 million kilowatts of electricity per hour. Fortunately, rather than being a deeply ingrained company concern, such energy bad practice is largely a surface problem that can be resolved quickly and easily by staff members adopting more responsible day-to-day habits. Therefore, although it is all well and good investing time, money and commitment in implementing a complete green office overhaul – fitting solar panels, insisting on biodegradable packaging, organic food in the cafeteria, etc –it makes better sense to begin by first tackling those simple ground level bad energy habits before jumping in at the deep end. Saving energy is the quickest method of reducing the office carbon footprint. The average energy costs of the average business can be reduced by 10 – 20% through simple actions that produce fast and sizable returns. The best technique in identifying target areas is to undertake an office ‘walk-round’. Identifying opportunities for cost saving measures. Spotting maintenance issues that require attention. Getting a better idea of what is happening on ground level. An office walk-round will demonstrate your personal commitment to improving energy efficiency in the office and encourage other staff to follow suit. It is also a good idea to welcome the suggestions and cooperation of other employees so that they feel involved in the creation of the sustainable workplace from the start. Despite its casual sounding name, a walk-round is not a cursory wander around the office - with attention only distracted by impending environmental disasters – rather it should be a careful and planned operation. Are lights are on when nobody is there or on when there is sufficient daylight illumination. Are there any ventilation fans operating in unoccupied areas? Are any workstations or desk lamps switched on in their user’s absence? Are thermostat settings correct and do they correspond with the office space temperature? Are there signs that the space is too warm or cold? Are there any building faults such as broken windows, wall cracks, dripping taps? To help compile a comprehensive checklist, it is a good idea to split it up into areas - this could be physical areas like the storeroom, kitchens etc or areas of energy concern such as maintenance, building fabric or lighting. A one off expedition is not enough - it would miss aspects that are only apparent at certain times of the day, for example. A walk-round is an ongoing procedure with several stages. The initial walk assesses the current situation in the whole of the office. Subsequent walks focus on individual problem areas identified on the first venture – such as lighting and heating use at different times of the day - and later they are used to reassess the situation after energy saving measures have been implemented. It’s no good assessing how the office is harming the environment if you then return to day-to-day work as if nothing has happened. A walk-round is useless unless it is followed up with a comprehensive green action plan, recommending and justifying appropriate action.